Pace was the biggest take away in the opening period as not many stoppages were had in the 1st period but it was the Vees who took advantage late in the frame after getting the better of the play in the opening period. James Miller shot the puck off the end boards as David Silye knocked it out of the air and past the glove side of Smoke Eaters goaltender Donovan Buskey for a 1-0 lead with 33 seconds remaining in the 1st period. That score would remain the same into the 2nd intermission but Trail had a couple of chances to get on the board, including an opportunity for Tyler Ghirardosi to extend his point streak to six games. He knocked the puck from a Vees player at the blue line and came down the right wing with a bit of a broken 2-on-1 chance, collecting the puck in the right face-off circle and having his wrist shot blocked away from Vees netminder Jack LaFontaine to keep the visitors ahead. Kent Johnson would get the next scoring chance for Trail, after scoring a highlight reel marker on Saturday as he tried to one-up that effort with a between-the-legs move in front of the net but was stuffed on the blocker side of LaFontaine to keep the game tied into the 3rd period. The lead didn’t last long into the final regulation period as Owen Ozar capitalized on a puck to the front of the net to tie the game just 20 seconds into the 3rd period. Braeden Tuck centered the puck from below the goal line as it ramped off of a stick to the blocker side where Ozar whacked in his 11th goal of the season out of mid-air to even the score at 1-1. Chances went for both sides through the duration of the 3rd period before Lukas Sillinger re-gained the Vees lead at the 17:14 mark of the period. The Smoke Eaters weren’t able to clear the zone as Sillinger found the puck in the slot and spun it toward the goal and past the glove side of Buskey to give the Vees a 2-1 lead late in the frame. Just 7 seconds after that, the Vees had an answer courtesy of a 2-on-1 after the face-off at centre ice. Carter Jones brought the puck in on the right wing and had Ozar going to the middle as he fed a pass for Ozar to tip in for his second goal of the game and a 2-2 tie at the 17:21 mark of the final regulation period and force overtime. Once again, the Smoke Eaters didn’t need much time in the extra frame to close the game out as only 9 seconds into OT, Carter Jones ended the game. After a scrambled draw at centre, Diarmad DiMurro got the puck and moved Trail into an odd-man rush in the offensive zone. DiMurro got to the right face-off circle and sent the puck to the trailer in Ozar who gave it back to DiMurro as he slid the puck across on the blocker side for Jones who beat LaFontaine over the right side for his 17th goal of the season and a 3-2 victory in overtime. Donovan Buskey had an outstanding night between the pipes, stopping 33 of the 35 shots he faced in his 3rd win of the season while Jack LaFontaine turned aside 28 of the 31 shots he faced in contest in his 12th loss of the season. 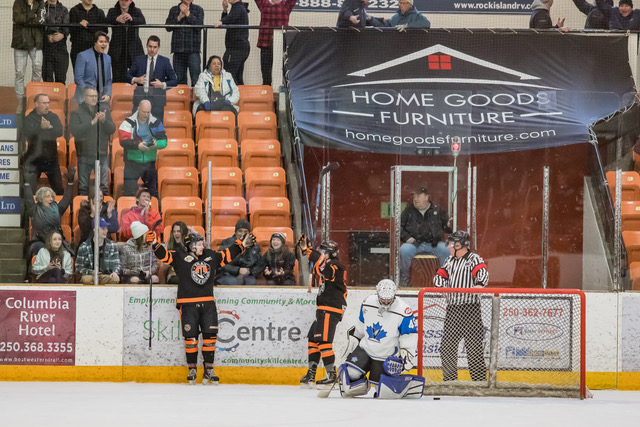 The Smoke Eaters (21-23-7-3) conclude their six-game home stand with their final “Retro Night” of the season as they host the Langley Rivermen (25-24-2-1) on Friday night at the Trail Memorial Centre. Puck drop is slated for 7:00 PM with tickets available for purchase at the Smoke Eaters Main Office as well as at the door ahead of the opening face-off.